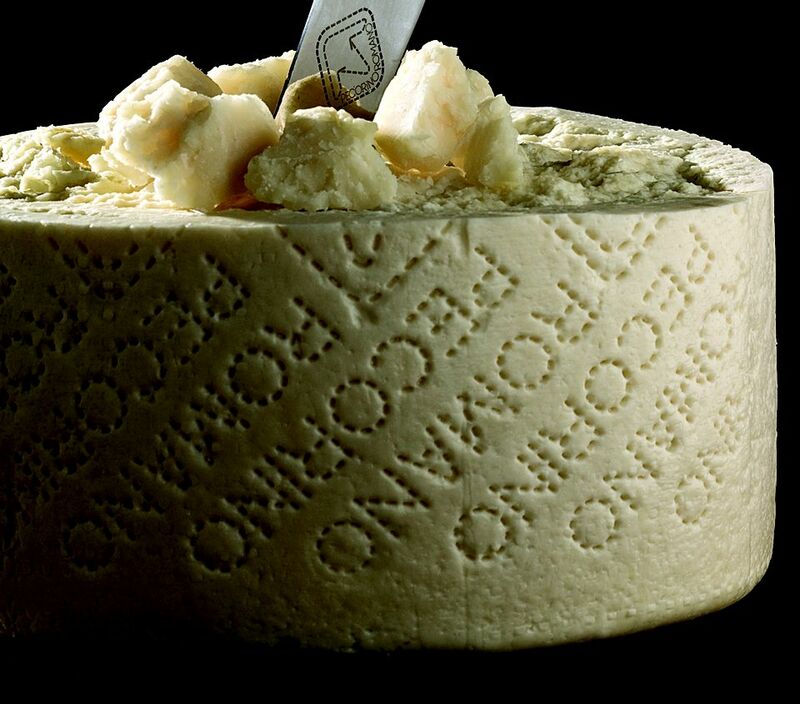 There are two major kinds of the sheep's milk cheese known as Pecorino in Italy. Young pecorino is a mild, slightly nutty cheese that becomes firmer and sharper with age while gaining a flaky texture. Young pecorino is not suited for grating, and though it can be used as an ingredient, it's best on its own, in a platter of cheeses or at the end of a meal, perhaps with a succulent pear. Much of this kind of pecorino is made either on the island of Sardinia, or in Tuscany, by Sardinian shepherds who came to the mainland in the '50s and '60s, and as a result, is generally labeled pecorino sardo or pecorino toscano. Then there's aged Pecorino Romano, which is saltier and firmer; it's an excellent grating cheese, and also works well as an ingredient because it doesn't melt into strings when it's cooked. In its milder renditions, it's also a nice addition to a cheese platter or with fruit, especially pears, while a chunk with a piece of crusty bread and a glass of red wine is a fine snack. Though one might expect Pecorino Romano to be made around Rome, its production area is considerably wider, extending into southern Tuscany and also Sardinia, which is where the Consorzio per la Tutela del Formaggio Pecorino Romano, the organization that oversees the production of Pecorino Romano, has its offices. Why would the organization overseeing the production of a Roman cheese have its offices in Sardinia? "the milk is usually curdled with lamb or kid rennet, though one can use wild thistle blossoms, càrtame, or fig sap. The milk bucket, when it is filled, must be kept warm, though it mustn't be set by the fire, as some would, nor must it be set too far from it, and as soon as the curds form they must be transferred to baskets or molds: Indeed, it's essential that the whey be drained off and separated from the solid matter immediately. It is for this reason that the farmers don't wait for the whey to drain away a drop at a time, but put a weight on the cheese as soon as it has firmed up, thus driving out the rest of the whey. When the cheese is removed from the baskets or molds, it must be placed in a cool dark place lest it spoils, on perfectly clean boards, covered with salt to draw out its acidic fluids." Though modern cheese makers use heaters rather than the fireplace and use calibrated molds rather than baskets, the basic process is unchanged; the curds are heated to 45 to 48 C (113 to 118 F), then turned out into molds and pressed, and the cheeses are then salted for 80 to 100 days. For the first few days they are turned and rubbed with coarse salt daily, then every 3 to 4 days, and finally weekly. The cheeses are then aged on pine boards for 5 months prior to release. The technique is very distinctive and imparts a characteristic salty sharpness to the cheese. Of course, cheese comes from milk, and it's important too. Pecorino Romano isn't simply made from sheep's milk but from the milk of sheep that have grazed in pastures with specific combinations of grasses that impart specific flavors to their milk. And this brings us back to why Pecorino Romano is made in the Tuscan Maremma and Sardinia, as well as around Rome. Its flavor is quite distinctive and it's an important ingredient in many southern Italian dishes. Those who left the south to seek better fortune abroad during the last decades of the 1800s and the early 1900s were forced to leave almost everything behind, but not their tastes. As soon as they settled they began to cook, and one of the ingredients they needed most was Pecorino Romano. There was no way to make it locally (different climate and forage mean a different cheese, even if the production technique is the same), but what was made in Lazio kept very well. By 1911, 7,500 tons were being sent annually to North America alone. The cheese makers couldn't meet this demand with the flocks in Lazio – not all pastures give the proper milk – so they searched elsewhere for pastures that would work, finding them in southern Tuscany and Sardinia. Currently, about 20,000 tons of Pecorino Romano are exported every year, 90% of which goes to North America. Pecorino Romano is an excellent source of calcium, and indeed Roman wet nurses were traditionally given Pecorino to enhance their milk. It's also a good source of phosphorous, potassium, and magnesium, and a good source of protein – a chunk of Romano is about 25% protein. It's also 31% fat, and though this is significant, people on diets often use it to flavor their foods because a little goes a long way. Pecorino Romano is an excellent grating cheese, and there are people who combine it with Parmigiano or prefer it to Parmigiano. It works especially well with greens-based pasta sauces or spicy pasta sauces, such as amatriciana or arrabbiata. It's also perfect as an ingredient, for example in meatballs or stuffings, because it doesn't become stringy when heated. Remember, if you add it to a recipe that doesn't call for it, to adjust the seasoning in the recipe, because Pecorino is salty. Forms of Pecorino Romano are barrel-shaped and weigh between 40 and 95 pounds (18 to 40 kg). Before release, the cheese is marked with a sheep's head inside a diamond and the rind is stamped with dotted letters spelling out "PECORINO ROMANO." Given their size, you won't want to buy a whole cheese, but rather a wedge. If you can, select one from the middle of the form, which will not have the bottom rind. The body of the cheese should be white with faint straw yellow overtones, and break with what the Consorzio describes as a "granitic aspect;" it shouldn't look too dry. When you get it home, store it in the cheese box in your refrigerator, wrapped in either plastic or aluminum foil to keep it from drying out. Do You Know What Mutton Is?